After finishing the heel and front of each shoe, I bound the edges of the tongue. I had originally left a small piece of elastic at the base of the tongue, but I trimmed it down as far as I could. I wasn't quite sure how far to go with the binding, but I reasoned that most of it would get covered with the buckle flaps. I glued the binding on with Shoe Goo, but I could have probably used a hot glue gun or other craft glue. I glued it one side at a time in small sections, holding them in place with pin curl clips. 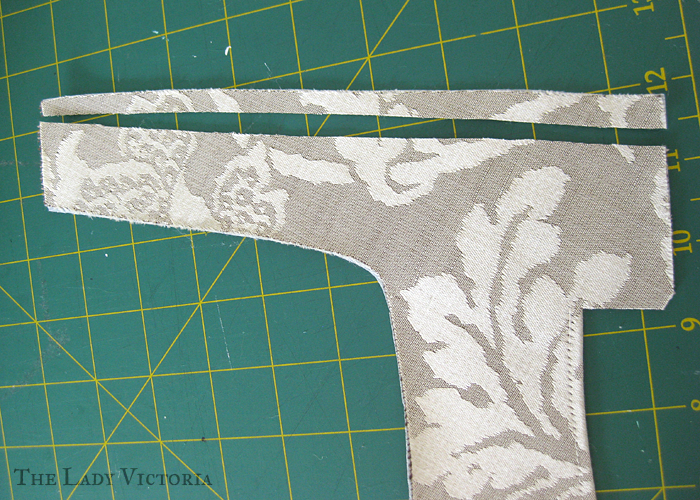 The binding wasn' bias binding, so it was tricky to get around corners. Not impossible though. 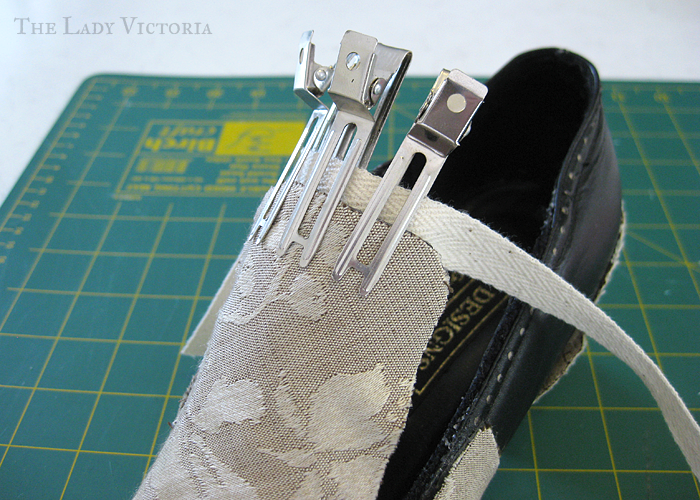 After the binding was finished on both shoes, I made a pattern for the straps. 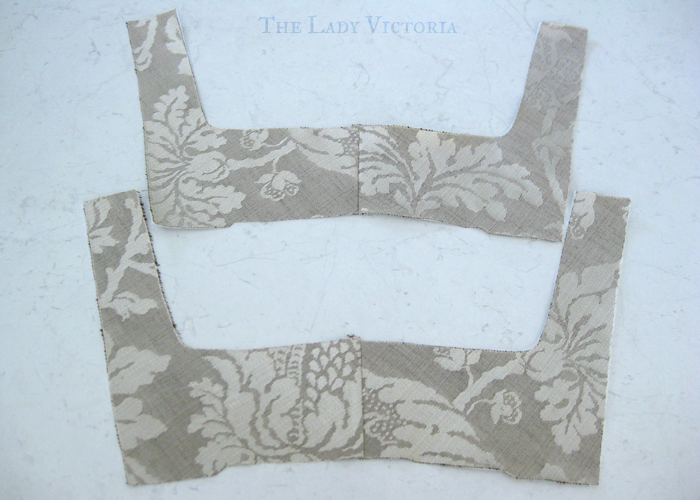 I made the pattern in two sections, then stitched them together to get a back seam. 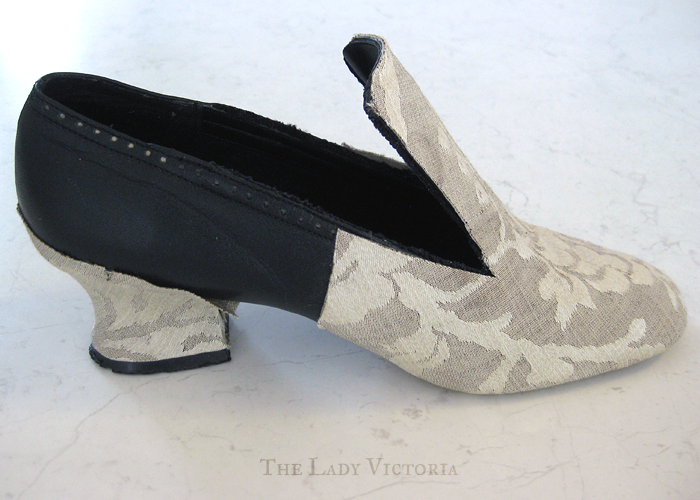 It could probably have been made as one piece, but I liked the look of the heel seam. 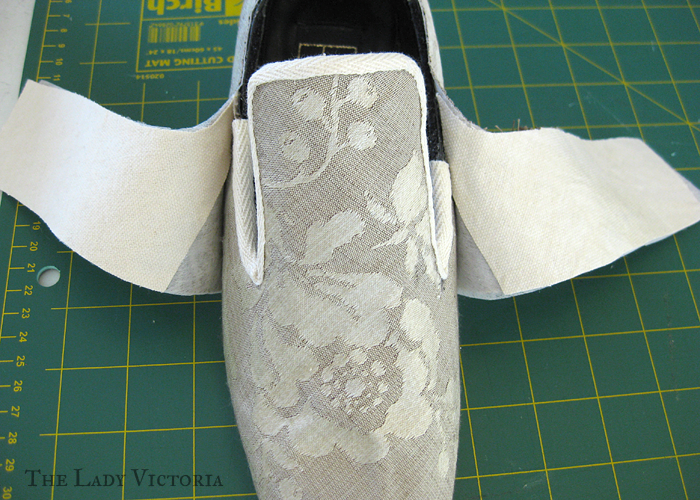 Cutting them as two pieces does allows you to control the bias on either side of the shoe though, and save fabric. 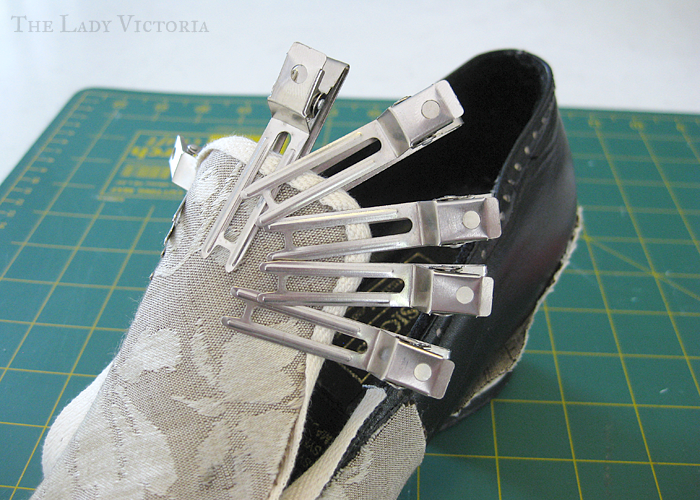 I tried the pieces over the shoe, pinning them on at the sides and centre back. 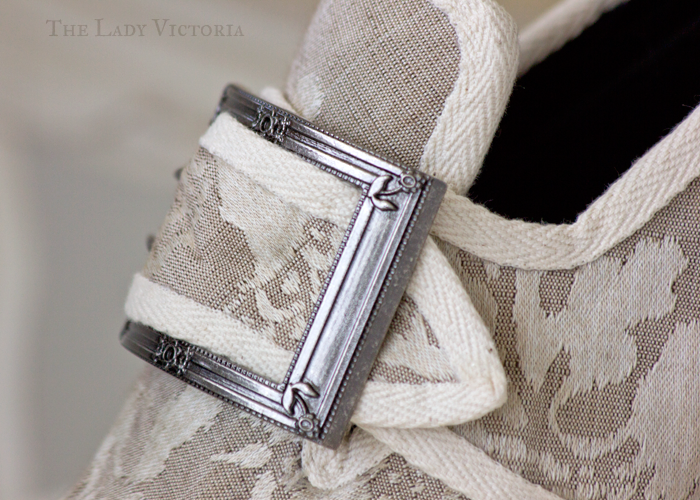 I marked the lower seam that would go over the heel and towards the front of the shoe, then folded it over and stitched it down, I did a bit of a messy job, but the white thread blended in quite nicely. Then I started gluing the straps down, starting from the centre back and going along the seam line. I let the glue set a little in between sections, as I really wanted to get the heavy seam stuck down well. 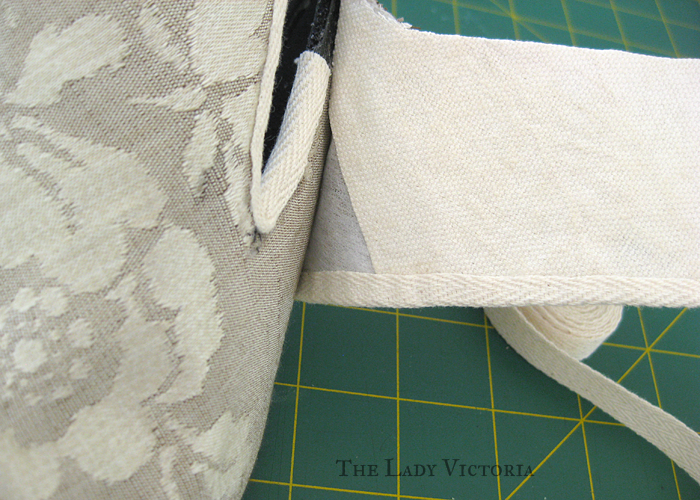 Even though it was cut on the bias, the fabric was tricky to stretch around the back of the shoe. 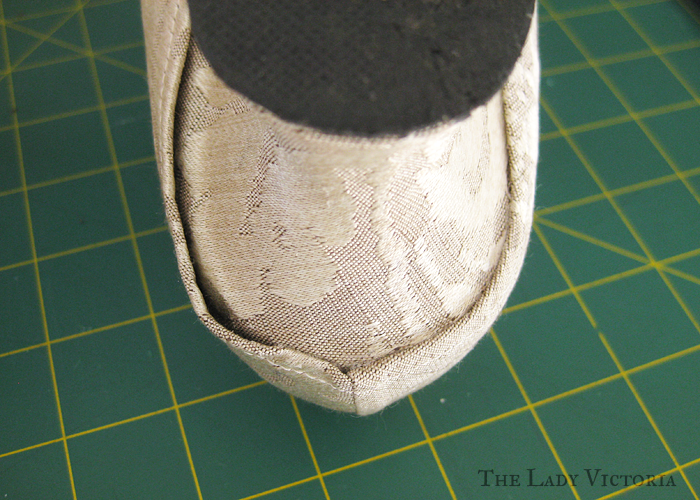 I focused on getting the seam straight, as I could cover the edge of the shoe with binding or trim any excess if it didn't fit. 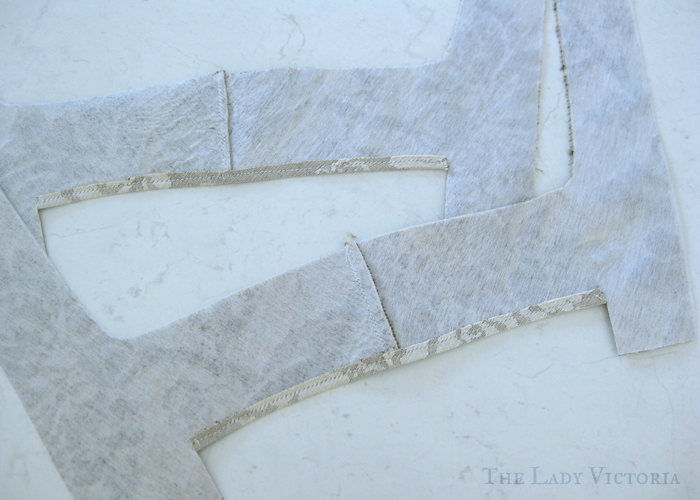 Here is a good picture showing one side of the seam glued down securely, and another that is loose. I used a broken sewing machine needle to poke glue into the gap, then held it down. I glued the entire back of he shoe on, right up to the start of the tongue. I tea dyed some leftover cotton duck from my stays to a nice cream colour, then cut them to fit the inside of the straps. 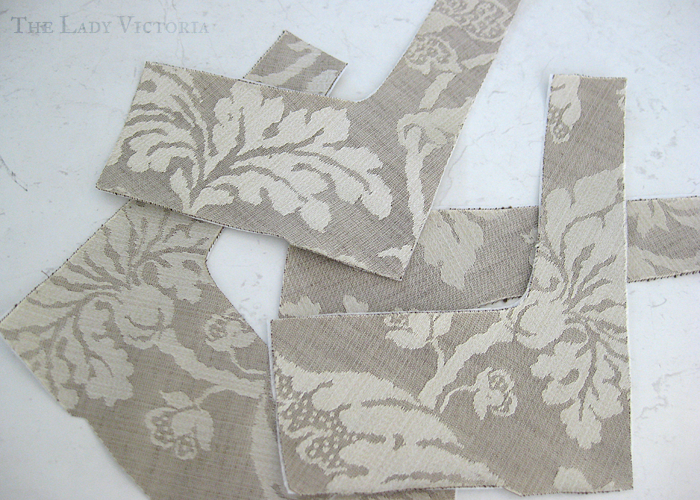 I covered the entirety of the straps with the lining, to make it easier to cut down later. 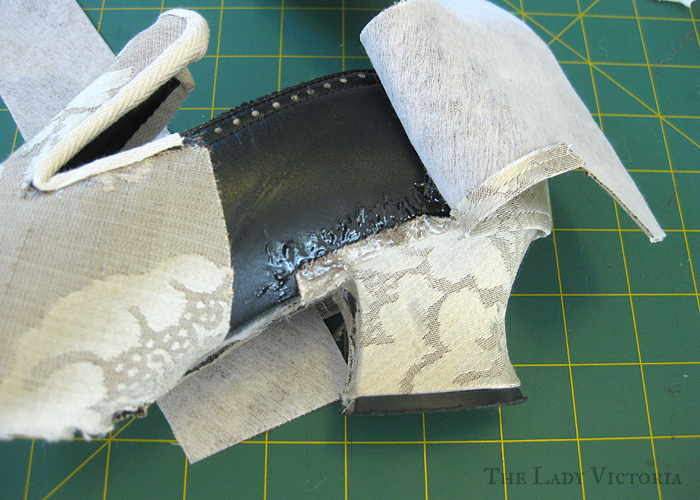 I used Shoe Goo to glue the fabric to the straps, which made it a little thick and stiff. Fabric glue would have been a better choice, but I didn't have any. 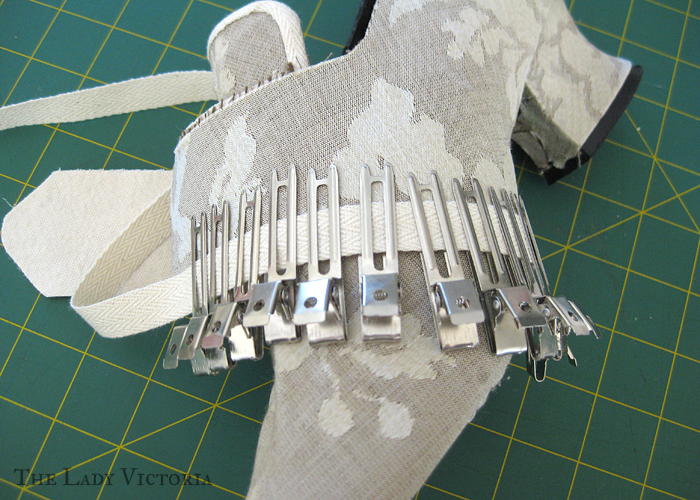 I deliberately left the base of the straps unglued to make it easier to attach the binding. 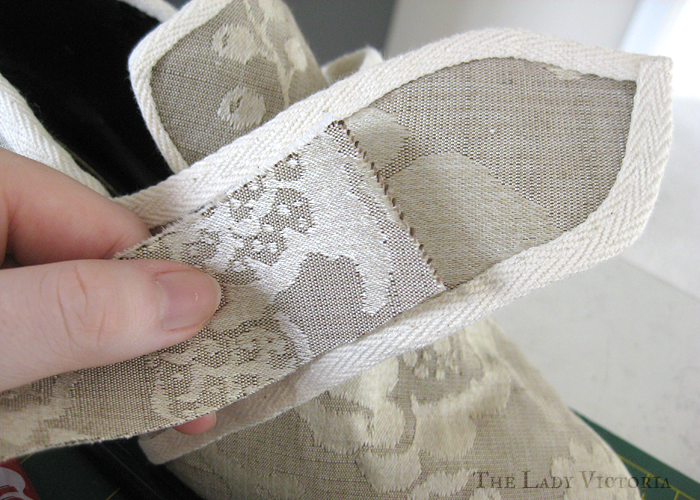 I did the binding in one continuous piece, starting from the base of the straps, going around the ends of the straps, over the back of the shoe and then covering the other strap. Like the tongue binding, I glued it on a small section at a time and held it in place with clips. 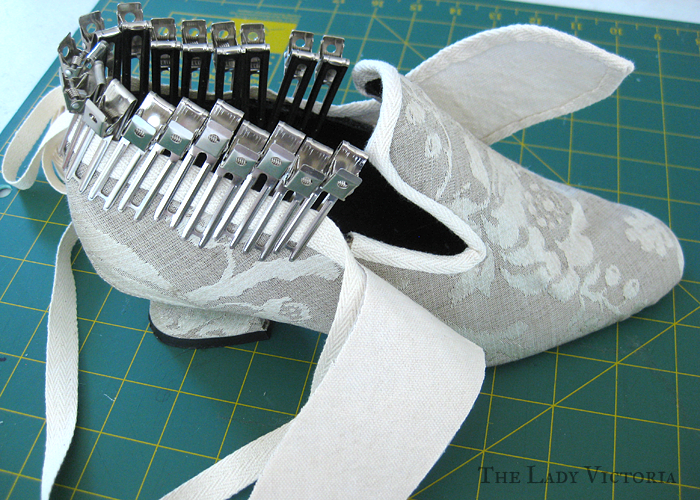 I did buy some trim for these shoes, and now would have been the time to glue it on over the binding. 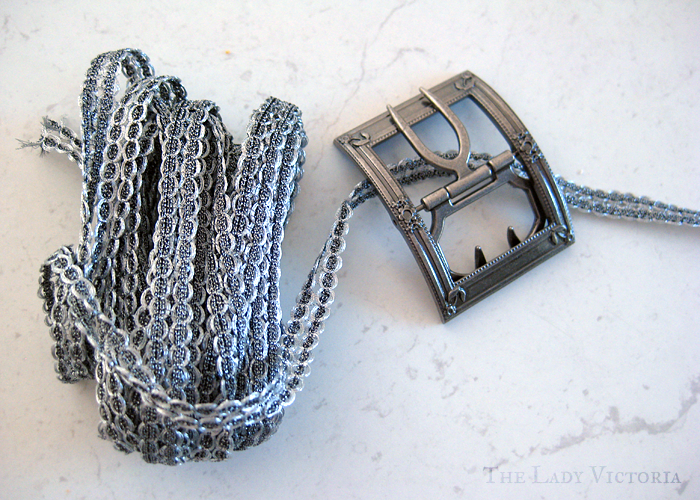 However, when I compared the trim next to my buckles it was a very cool silver, where my buckles were a warm silver. I could have tried to dye it slightly to match, but I quite liked how the shoe looked without trim. 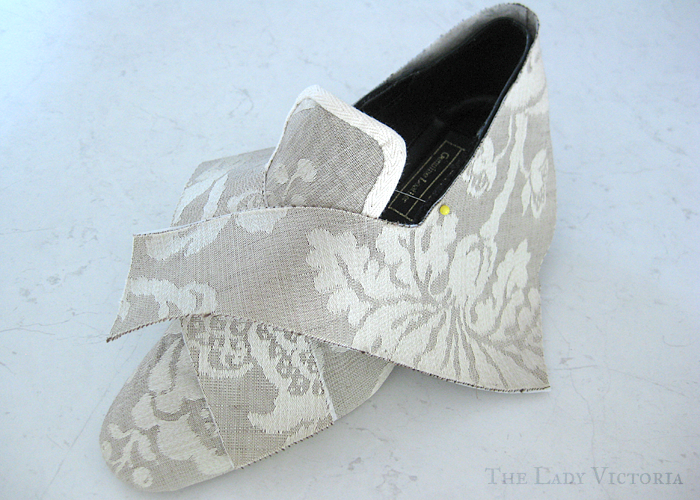 There are lots of extant examples of shoes with contrasting binding and no trim. After finishing the binding on my first shoe and gluing the base of the straps down, I tried it on. It was only then that I realized my straps were far too wide for my buckles. I could only fit them through the chape by folding them in half! I let my shoes sit unfinished while I thought of what to do. 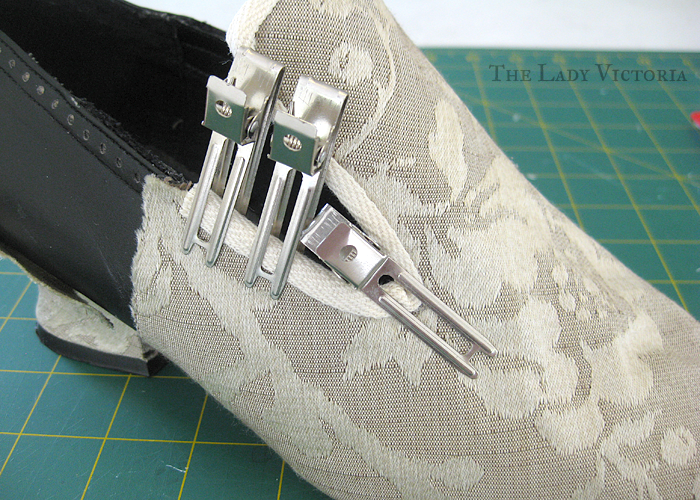 I still had the straps on the second shoe to finish, which I could cut down to the right size. I glued and bound the straps of the second shoe, and it fit almost perfectly with my buckles. When I went to re-cut the straps on my first shoe, my camera ran out of battery, but it was a simple process. I peeled back the base of the straps, just far enough for the binding to come loose. 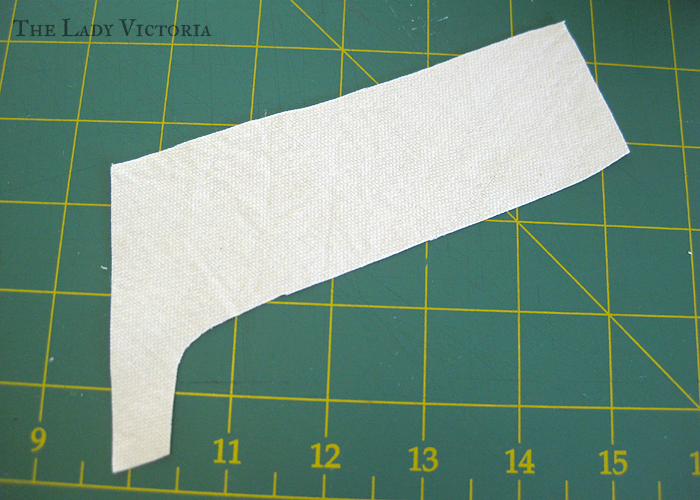 I then cut the binding off up to the tip of the strap, and rebound the skinnier strap. 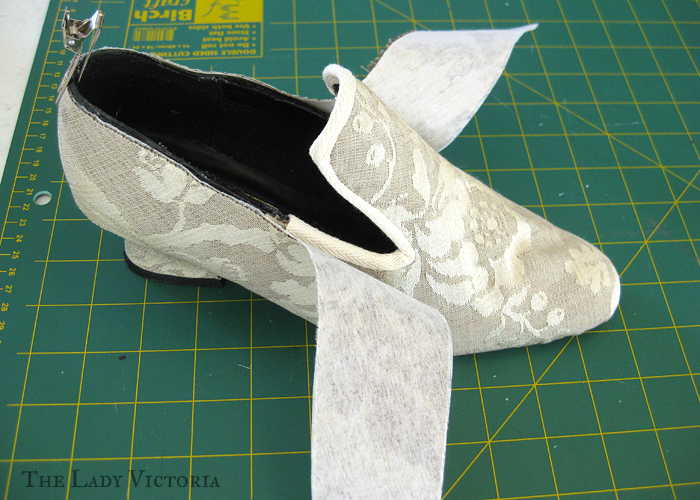 All I had left to do was glue down a bit of black ribbon on the back of the shoe to hide where the heel fabric had been folded over. Using leather or some sort of vinyl would have been better, but I had ribbon on hand. I glued the sole back on a small amount at a time, removing any Goo that seeped out of the edges. Then I was done! I'll be posting photos of the finished shoes soon, along with my finished stockings.